Throughout the month of December, my class studies Holiday Customs Around the World. But as we near the final days before winter break, I know their focus on most content is hazy at best. This super adorable elf glyph and narrative writing lesson is fun and easy. The end result is too cute and HUGE. The kiddos leave the classroom with their little elf friend with nothing but smiles. The Elf Glyph is always a huge hit! In addition to the cute craft/glyph, this resource includes a narrative writing lesson. Like all of my writing resources, the lesson begins with building a little background. Although you could create any writing assignment you want to go with this elf (or none at all), the lesson in the resource suggests writing about an elf with a slightly flawed character trait. I build background for the assignment with read-alouds with some lovable, but problem characters. Here are some Amazon affiliate links to a few of my favorites. After a little lesson on character traits, we work on creating our own elf character with a trait that affects his or her day. The Elf Glyph and Narrative Writing Lesson provides a complete narrative writing lesson, including step-by-step instructions that assist students in writing a plan, draft and final published piece. The answers to these questions are used to complete the tag on the elf’s gift as well as help “build” the elf with parts specific to their answers. 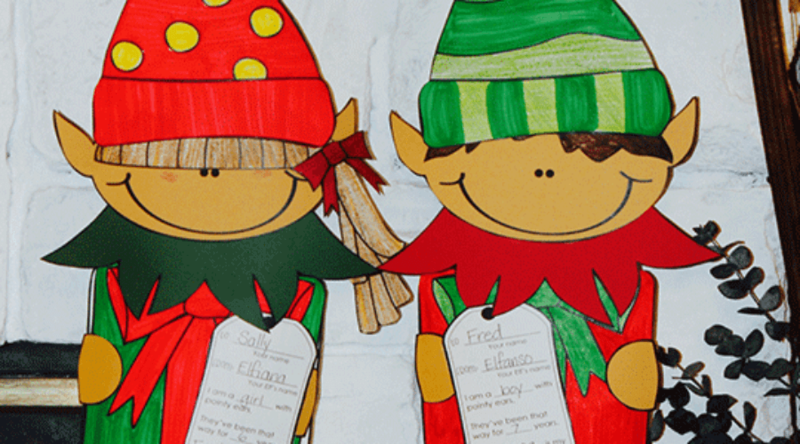 After completing the elf assembly, students can attach their narrative story to the back of the gift box. The resource includes 2 different sized final draft stationery choices, too. The Elf Glyph and Narrative Writing Lesson is an activity I like to do that last week before we go on break. It’s easy, engaging, and loads of cute fun! Plus, their stories always crack me up! You can find the Elf Glyph and Narrative Writing Lesson in my TpT store.